The architecture of this phenomenal D'Leedon residence is the work of late architect, Zaha Hadid. Featuring clean lines and undulating waves on its exterior, the interior designed by SuMisura creates a cosy atmosphere with dark timber panelling and soft rugs; accent furniture such as the crescent-shaped sofa paying homage to the Hadid's architectural oeuvre. 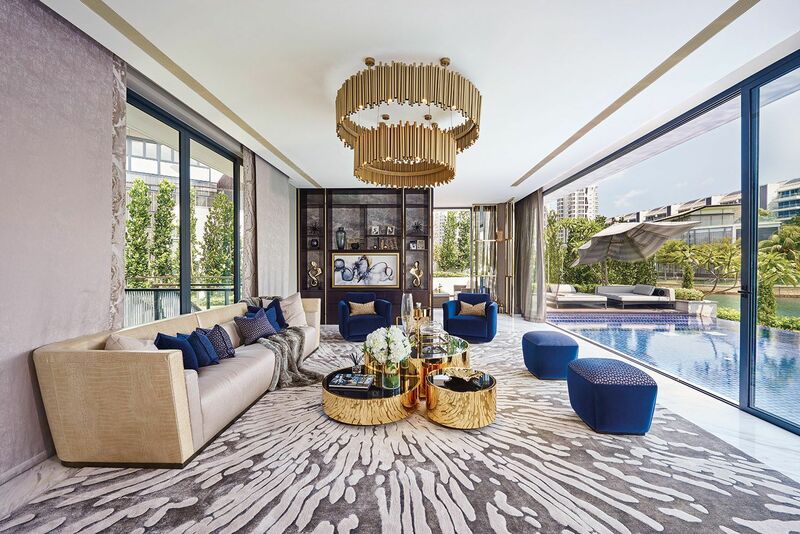 The work of Designworx Interior Consultant, this spacious three-storey penthouse features a contemporary interior, inspired by the homeowner's favourite travel destinations in China and Japan. Greeted by a golden bonsai and handpainted silkscreen in the living area, the elegant ambience continues throughout the home to create a holiday home that the family enjoys returning to. Living on the waterfront certainly does have its perks as you have access to unprecedented views of the water. Resembling a yacht at sea, this elongated and spacious one-story apartment designed by Prestige Global Designs has an extended outdoor terrace that has a Jacuzzi and deck that overlooks the marina as well. A labour of love from a father to his family, this stylish residence features high ceilings, glass walls and a distinct lack of clutter. According to architect Edmund Ng, a less-is-more approach serves as the crux of the home's design. Clad with an electic mix of art, this 2,509sqft apartment is home to Ukrainian couple Kateryna and Sergiy Pervak. In collaboration with interior designer New Nyew and her eponymous firm, the design process took a total of two months to complete for Kateryna and her husband to enjoy. Situated near the coast in the East, the ground-floor residence sports five-metre high ceilings, four bedrooms, and a veranda that comes equipped with a Jacuzzi and dining area. Furnished with pops of colour on artworks and upholstery hand-picked by the couple, the apartment is also flooded with natural light, with plants perched all around the veranda to liven up the space. Contemporary Asian art anchors the concept of this abode, as the interiors were designed around the couple's favourite art pieces; the family tasked Design Rebirth to design the interiors of their new house. Apart from the double-volume hall that makes up this the cavernous three-storey house, it also has a rooftop terrace fitted with cabanas and a cocktail bar—a space where the family often finds themselves entertaining guests. A modern and integrated family home that will last through the generations, the owner of this minimalist house worked with Inte Architects to redesign his estate to accommodate his ever-growing family. Comprising two separate buildings connected by a link bridge that overlooks the pool and deck, its exterior facade was furnished in concrete to form a textural contrast against its use of glass. A project by Design Intervention, this East Coast residence features floor-to-ceiling French windows and architectural details inspired by Peranakan-style shophouses in the neighbourhood. Filled with bespoke cabinetry, the well-appointed kitchen is the heart of the home for a couple who loves to entertain—it plays host to a steady stream of guests and it's their favourite space in the house. This Sentosa Cove residence was inspired by the Amalfi Coast and designed by The Mill for a well-travelled family as their holiday home. This six bedroom has a stylish interior that has been largely furnished by Fendi Casa, as well as Italian furniture purveyors Cassina and Fiam Italia. Bespoke chandeliers, plush textures and marble flooring can also be found throughout the residence; the residence is also home to a private home theatre fully furnished with American audio brand Sonos and outdoor spa that is equipped with a Jacuzzi and spa bed. The work of Prestige Global Designs, this family haven is a tropical sanctuary. Furnished with neutral tones and gold accents, the two-storey penthouse also sports playful elements, such as an artwork inspired by the Marvel Comics universe that takes pride of place in the kitchen.